Five More Examples of Auto Dealer Fraud | The Consumer Law Group, P.C. There are many ways a dealer can get more money out of you than a car is worth. We discussed five common scams here, and now we present five more examples of dealer fraud. A savvy consumer will be aware of all the possible ways a dealer could cheat her out of her hard-earned cash. Buy-Lease switch. You have made the decision to buy a car, not lease one, but the contract you are being asked to sign is unclear. Don’t be caught by this common scam. Dealers will try to convince you that a lease is actually a purchase. Read the contract carefully to make sure it does not have the word “lease” in it anywhere. If a salesperson tells you that you will own the vehicle at the end of the lease, understand that is only true once you make a large payment. Trade-in fraud. Dishonest dealers always want something for nothing. If you don’t know the actual value of the car you plan to trade in, you are likely to be offered much less than it is worth. Before negotiating a trade-in offer, look up the Blue Book value of your car. 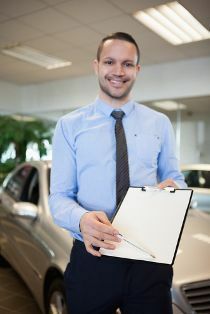 Oftentimes, you will pocket more cash by selling the car yourself than by using it as a trade-in. Co-signer fraud. If you are asked by a friend to be a co-signer on a car loan, understand that you are equally responsible for repaying the loan, even if the dealer tells you that you are only signing as a reference for the primary buyer. If your friend can’t qualify on his own, it is likely that you will end up owing for the car. It is never a good idea to be a co-signer for any type of loan. Requiring options. If a dealer or salesperson tries to tell you that in order to qualify for certain financing terms, you must agree to purchase options or services, he is committing fraud. Walk away from any dealer who does this. If you suspect that a dealer acted fraudulently in your new or used car purchase or lease, contact us for a free review of your case. If you are able to provide proof that the dealer acted dishonestly, you may have a strong case for fraud. Are Bait-and-Switch Tactics Considered Fraud?